Prominent & Leading Manufacturer from Ahmedabad, we offer rek pp-hdpe-ldpe reprocess machine. REK PP-HDPE-LDPE Reprocess MachinePlastic Re-Processing is one of the most important Extrusion process in the Industry . For Every grade of Plastic the machine and process differs . We at Leena Extrusion deal in Re-Process of PP-HDPE-LD . Now there are various kinds of Articles which Recycled Like Carry Bags manufactured from HDPE or Commonly term used HM , Raffia or Woven Sack which is Manufactured from PP - HDPE . Dairy Products Packaging Plastic , Water Pouches , Linear etc are manufactured from LDPE / LLDPE . 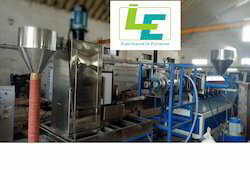 At Leena Extrusion we have three types of Extrusion Re-Process Machine for HDPE - PP -LDPE - LLDPE . Our First Model is a Normal Re-Process wherein we provide machine for LDPE with a Minimum Production Capacity of 150 Kg Per hour , However if in the same machine PP - HDPE is Processed the Production capacity could be 90 - 100 Kg per hour . This Machine Consist of Extruder , Hydraulic Screen Changer for Filtration and a Palletizer or know as the cutter . The other kind of Machine that could be Manufactured is Know as Vented Re-Process machine . Vent means a Pipe with an Open End and here it refers to the Barrel which has open duct which helps to remove the moisture from the Barrel which the waste is melted by providing Heat . The third kind of plant that could be supplied is Plastic Re-Process with Die Face Cutter , the benefit here compare to other Re-Process is that after filtration or screen changer it is connected with die and with blades which gives and accurate size of granules and also the shape is similar to a virgin granules . Now here after the comes from die it goes to the water and it cooled after which it goes to chamber which provides heat and in that way the moisture is removed from the granules around 90 % . Here the Important thing to understand about the Process is the Normal Extruder Granules will have some amount of moisture and Granules Shape and size will not be accurate , the only difference in Normal Re-Process and Vented would the Moisture could be removed in Vented Re-Process Machine . Now lets understand what are industries wherein this granules are used . The first is a Plastic Sutli or Synthetic String around 90 % of Sutli that is available in market is manufactured from Re-Process Granules , PP - HDPE Box Strapping is also another Extrusion Process where in its Manufactured from Re-Processed Granules . A Blown Tarapaulin is Manufactured from LDPE it could be Mono , Two and Multi Layer Process all could be manufactured from LDPE Re-Process Granules . There are certain amount of Re-Process granules that is also used in manufacturing of Carry Bags , Garbage Bags , LDPE Film , Trays etc . Here as this Plastic is used in some important sector which is related to food industry so in order to remove the dirt and smell this Plastics are washed through a Plastic Washing line and then it goes through Extrusion Process which forms to Granules .